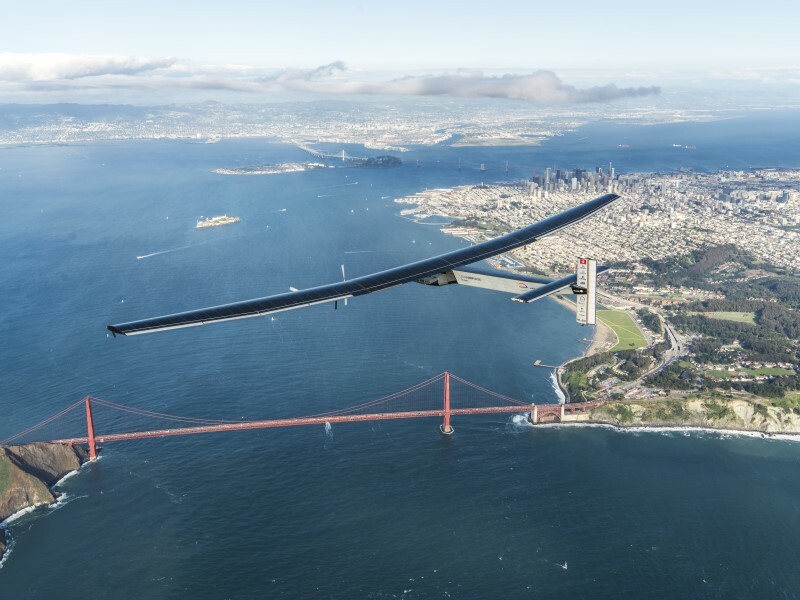 Swiss pilot Bertrand Piccard made headlines on Saturday when he glided a solar-powered plane onto Moffett Airfield in California after a three-day journey across the Pacific Ocean. It’s the most recent stop in an around-the-world trip that began in Abu Dhabi last spring and is intended to raise awareness about the importance of reducing carbon emissions through the use of clean energy. The plane itself, “Solar Impulse 2,” is a true zero-fuel aircraft, powered by more than 17,000 solar cells. It’s designed to carry just one pilot – Piccard and his colleague André Borschberg have been tag-teaming the journey around the world – and has the wingspan of a jumbo jet, although it weighs only two tons. The daring trans-Pacific flight has drawn global interest to the concept of electric planes, which have existed in various forms for several decades now. Some designs rely on solar cells, while others use various types of batteries, but the overall goal is the same: to achieve flight with minimal or no fuel burning. Electric aircraft are among the more ambitious technologies being researched around the world in an effort to reduce carbon emissions from aviation. It’s a cause that’s rapidly gaining international attention. Aviation is currently responsible for about 1 percent of all the world’s carbon emissions – and as air traffic is expected to experience rapid growth in the coming decades, that proportion could quickly climb if no steps are taken to improve the fuel efficiency of aircraft. Some estimates have suggested that by 2020, emissions from aviation could be 70 percent higher than they were in 2005. To that end, the UN’s International Civil Aviation Organization (ICAO) proposed the world’s first carbon dioxide emissions standards for aircraft back in February. And while some environmentalists have argued that the proposal did not go far enough, the action has placed aircraft emissions on the international radar – and scientists around the world are researching ways to reduce them. Electric flight, however, may be among the technologies that are furthest from becoming practical. So far, most of the electric planes that have achieved flight have only been able to accommodate one or two people, and it will likely be at least a decade or two before the technology will progress to the point that it’s commercially viable. “The big challenge is the batteries,” said David Zingg, director of the University of Toronto’s Institute for Aerospace Studies. For electric planes to become competitive, their power sources need to be able to store more energy per unit mass – otherwise, their speed and weight capacities will remain impractically low.